I haven't had much time for cooking since The Hubs and I arrived in Germany. Of course, I also had no pots and pans (or anything else for that matter! ), so cooking would have posed a few problems anyway. But I've really missed this daily chore. Which for me is really no chore at all, more like a mad science experiment. And I've especially missed cooking with my friends, or cooking for them (and them cooking for me!). Remember my deployment battle buddies? Of course you do! 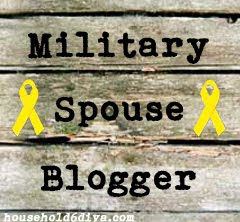 We developed Ladies' Night In, a fantastic opportunity to hang out together and test our culinary skills on each other. I really, really miss my ladies. I think they should all move to Germany too! I'd like you to be on my side in this matter. Earlier this week, when I was especially missing my gal pals, I came across these photos of an experiment gone right. 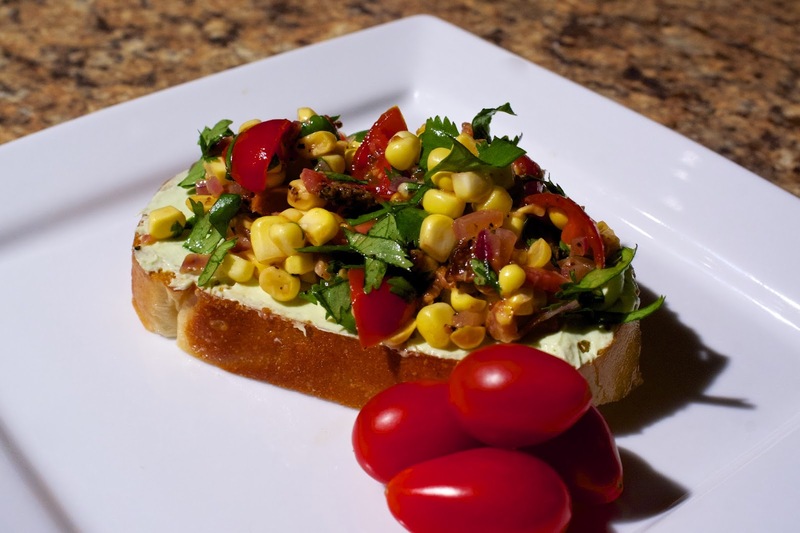 Inspired by my best Canadian pal, and another Ladies' Night In moment, I created this Fresh Corn and Tomato Bruschetta. Let me repeat that. Nom nom nom nom nom. You've no idea, seriously. This is a MUST try. Hubs will be forever grateful to Ladies Night In evenings for this delicious treat. After the creation, we actually ate it three more times in the same week! To start, I should warn you: This recipe makes A LOT. But don't worry, you'll eat it all. Or, make this as an appetizer for a party. Huge hit. HUGE. As usual, my pictures don't quite capture all the ingredients. After creation, I realized I need twice the filling to use up all the spread (you'll see). So, some of the ingredients are actually double what you see here. Plus, ahem... you won't be using basil at all, but cilantro instead. Anyway, let's begin with the spread. Using a ripe avocado, blend it together with 8 ounces of whipped cream cheese (1 container), 1 tablespoon fresh lemon juice, and five cloves of roasted garlic. If you've never roasted garlic before, it's quite simple. This tutorial on WikiHow is easy to follow. The picture above is what your spread will look like once blended. For now, set this mixture aside in your refrigerator while you finish the rest. Next, slices two loaves of French (or Italian) bread. I like mine sliced thick, but this is up to you. The thicker the bread, the more topping it will comfortably hold. I'm a glutton for this stuff. Toast the bread using your preferred method. I like the bread toasted on only one side, so I usually spray that side with a bit of baking spray, then toss it under the broiler for a few minutes. You can toast yours however you like! 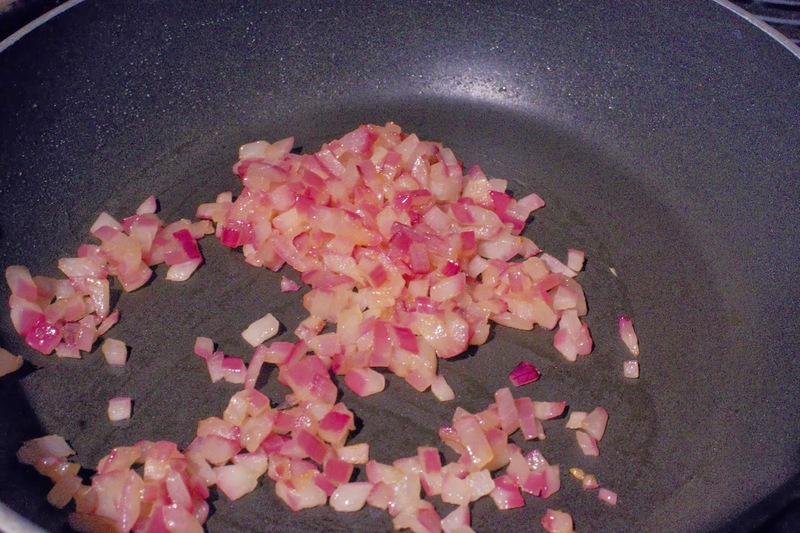 In the meantime, finely chop 2 small red onions (or 1, if you like things less oniony). Sauté in a bit of butter to draw the sweetness out. Set aside to cool. At the same time (or separately if you've a tendency to get distracted and burn stuff), cook 12 slices of peppered bacon. If you don't have access to peppered bacon, that's ok. Just add a little extra pepper to your final corn mixture to make up for it, kay? Crumble the bacon into small pieces. Now comes the really fun part. In a large mixing bowl, mix together your onions and bacon, plus 4 ears worth of sliced-off-the-cob corn kernels. You heard me, just slice it right off the cob and into the bowl. No cooking necessary! To this, add 1 pint of quartered cherry (or grape) tomatoes. Drizzle in just enough olive oil to coat (about 2 teaspoons, maybe less). Salt and pepper to taste. This doesn't require much! Unless, of course, you are without the peppered portion of the bacon. Gently stir in some chopped cilantro. I used... a bunch. Maybe two bunches. Probably about a cup. Everything else is a cake walk! 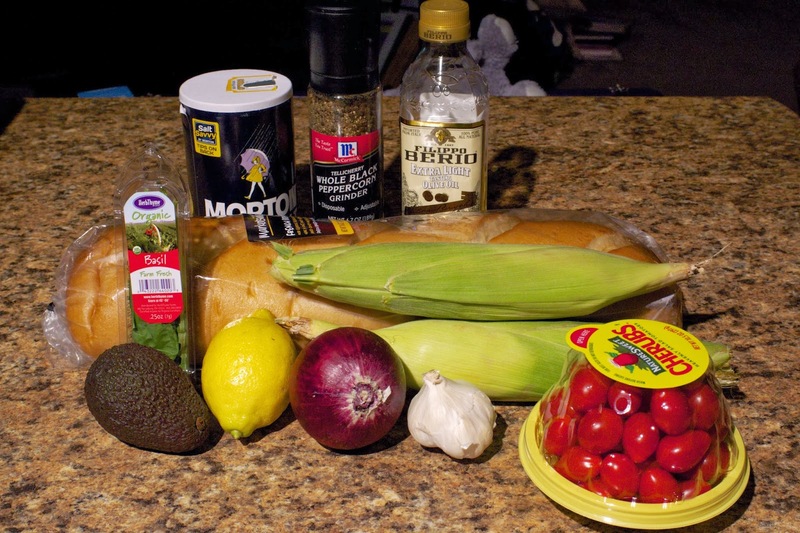 Shmear your bread with a bit of the avocado mixture, and then spoon some corn mixture on top. Bite in. Savor the moment. Thank Caleigh for the inspiration, because your life won't ever be the same after this. As always peeps, I've included the recipe at the bottom here. I'll be back in my kitchen soon, testing some new recipes for my favorite people. 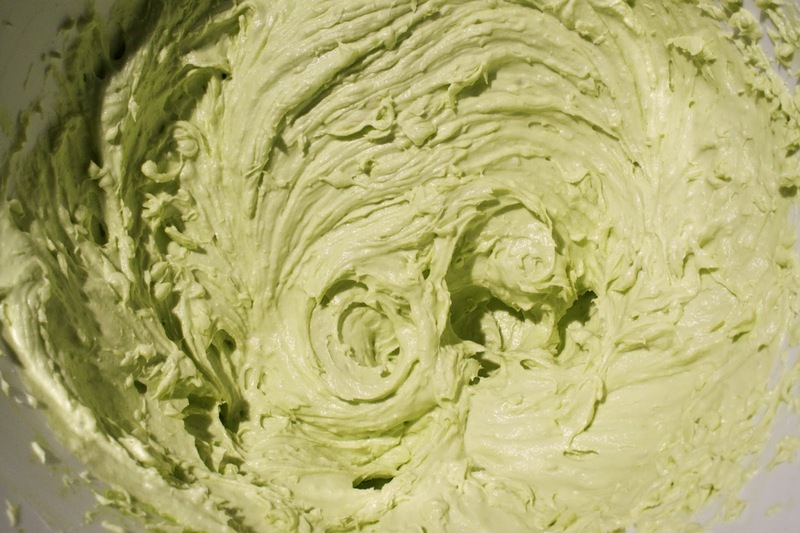 In a large mixing bowl, blend the cream cheese with the avocado, roasted garlic, and lemon juice until smooth. Set aside. Slice your French (or Italian) bread into thick slices. Spray one side with cooking spray (if desired) and brown underneath the broiler. Keep close watch on your bread, you don’t want it to burn! Alternatively, you can toast in a regular toaster. Set aside to cool. 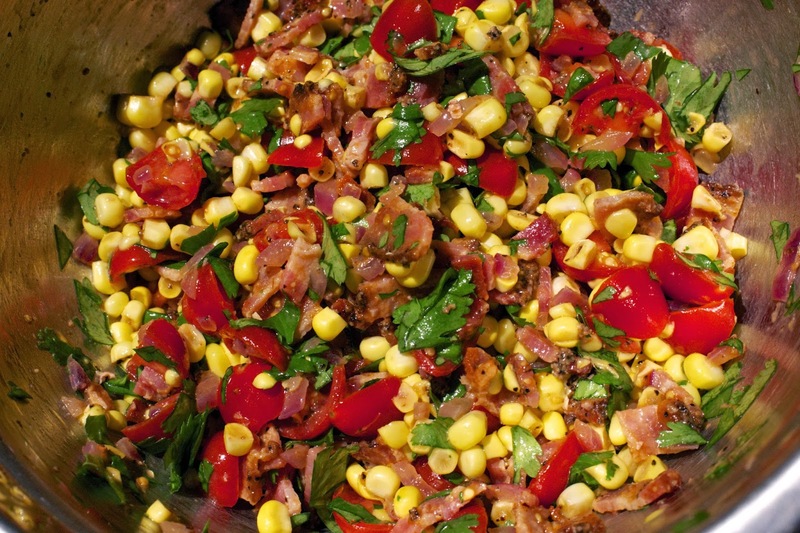 In another bowl, stir together the fresh corn kernels, tomatoes, sautéed red onion, and peppered bacon. Drizzle in the olive oil, adding just enough to lightly coat. Salt and pepper to taste. Gently stir in the chopped cilantro.